Tenjindo Shrine in Neomura (根尾村天神堂), Motosu City (本巣市) in Gifu Prefecture after the Nobi Earthquake (濃尾地震, Nobi Jishin) of October 28, 1891 (Meiji 24). 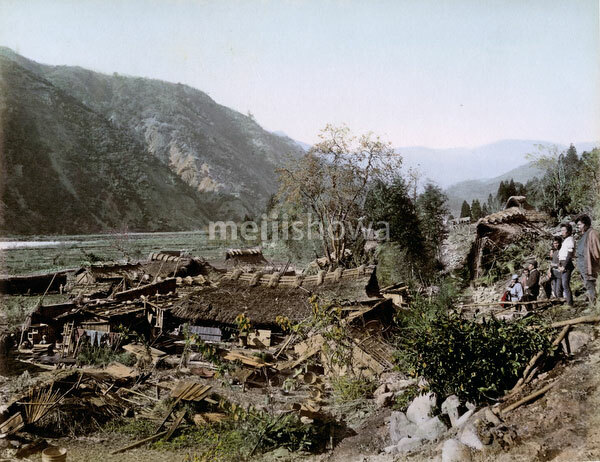 The Nobi Earthquake measured between 8.0 and 8.4 on the scale of Richter and caused 7,273 deaths, 17,175 casualties and the destruction of 142,177 homes. It is the largest recorded quake in inland Japan. It jumpstarted the study of seismology in Japan and proved that earthquakes are caused by fault lines.